I guess it could be all those Chinese soups he drank in his youth. 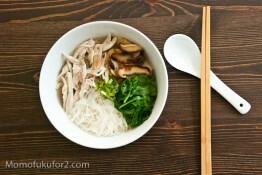 Chinese soups are supposed to have healing, restorative qualities. I’m not too sure about the health benefits, but I do know that they taste good. I’ve never actually made Chinese soup; if want some, it’s just much easier to go back to my parent’s place. Chinese soups are long-boiling, mysterious creatures. 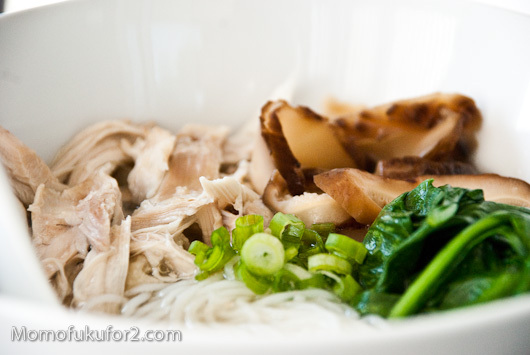 What I do make, instead of those long-boiling pots of soup, is a simple chicken and ginger broth. I love the subtle spiciness of the ginger in this soup. 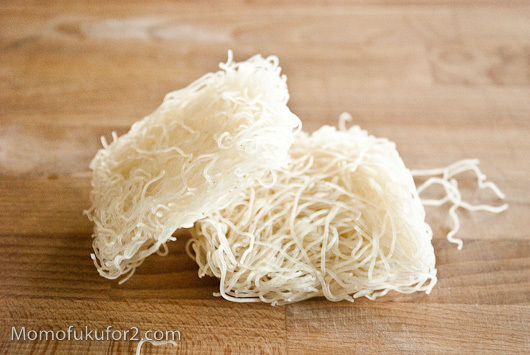 It’s great as the broth for a bowl full of noodles. 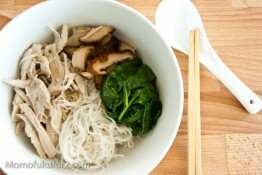 Add some shredded chicken, shiitake mushrooms, a green vegetable, and some green onions and you have a meal. Not as time-consuming or traditional as true Chinese soups, but tasty nonetheless! 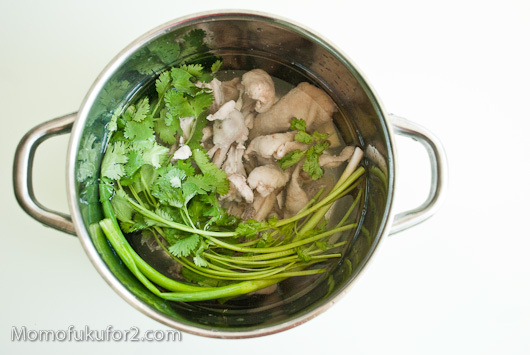 Put your chicken bones in a pot and barely cover with water. Bring to a boil and keep it at high heat for 5 minutes to boil out the impurities and scum. Rise off the bones and give the pot a good wash. 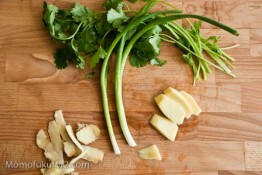 Fill the pot with 2 quarts of cold water, add the rinsed off bones and the ginger, green onions and cilantro. Bring to a boil and reduce to a bubbly simmer. Let the stock simmer for up to 2 hours. When it’s time to eat, strain out the solids and season the broth to taste. Cook the noodles according to the package. Briefly blanch the spinach in boiling water. 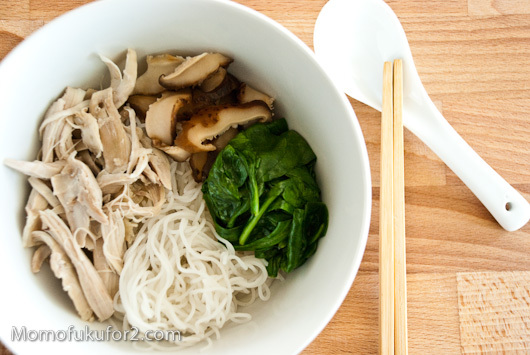 Put your noodles in a deep bowl and top with shredded chicken, spinach, and shiitake mushrooms. Enjoy! It’s funny how universal chicken soup is. I think only Eskimos and vegetarians don’t have some variation. Good to see you’re taking care of yourself while you are sick. 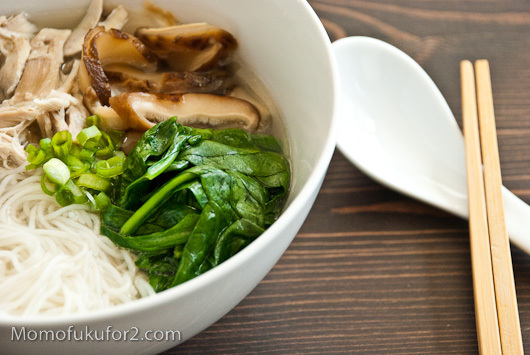 I’m sure vegetarians find vegetarian noodle soup just as healing! Couldn’t agree with you more. Chinese people are big fans of soup. My father and father-in-law demand to have soup everyday. They just don’t feel they have eaten any meals without soup. They think soups are healthier than other foods. It’s funny, but you’re right, they don’t feel like it’s a complete meal without soup! Haha, so true. Though my mom says the daily soup thing is more Cantonese than pan-Chinese. Yes, the Cantonese seem pretty obsessed with it! I’m sick at home and just made myself almost the same soup! I was checking out how other people do it. I didn’t have any cilantro or shiitakes, but I used a bunch of white pepper and standard supermarket mushrooms. and they are just a few that have scientifically been proven. But at least i know what to make for dinner tonight!.